Edvard Munch (1863-1944) is an artist who many people have probably heard of but few know much about. Of course he is primarily known for his work The Scream, but there is so much more to him than just being the maker of one famous image. This exhibition aims to reconsider him by focusing on his works (often quite radical) made in the twentieth century and his overlooked engagement with modern media such as photography, film and his interest in new forms of theatre being pioneered by figures such as Henrik Ibsen. 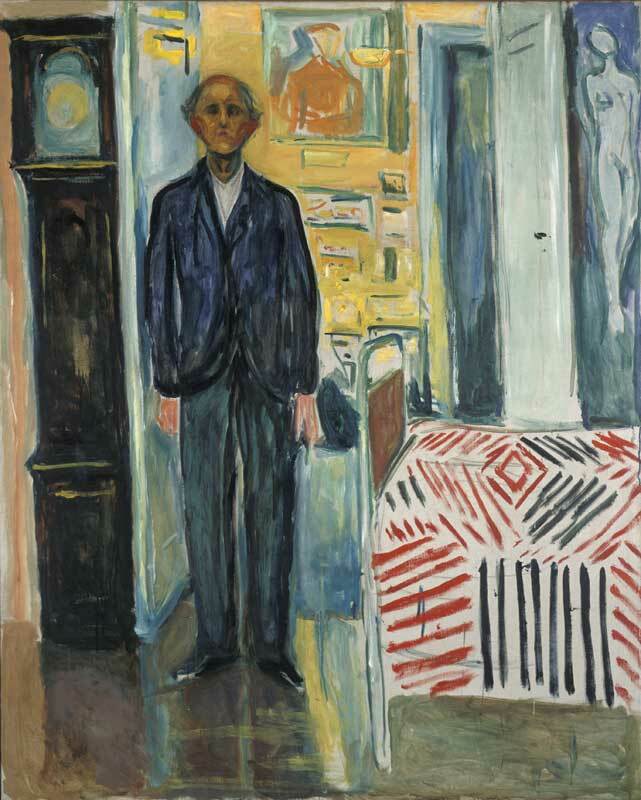 The exhibition is blessed with many great loans from the Munch Museum in Oslo such as Red Virginia Creeper and Self Portrait: Between the Clock and the Bed and many other lenders across the world. Beyond the clichés of Munch as an angst-ridden and brooding Nordic artist who painted scenes of isolation and trauma, this exhibition considers more nuanced, complicated and neglected aspects of his life and work – his fascination with new technologies and modern medium such as film and photography and the way this influenced his painting, and his obsessive reworking of motifs in his paintings for reasons that are still unclear. We hope this will fascinate people and lead to a truer and fuller understanding of the achievements of this complex and compelling figure. At the moment, we are busy making final preparations before the installation proper begins on Monday. The week before you start installing an exhibition is always the relative calm before the storm. By this point, most things for the exhibition are done and the works of art are already on their way to you. So, all you can do is wait to begin and deal with any final issues as they arise. This period is also when you have the chance to make any final tweaks. For example, I always obsess over choosing the wall colours of an exhibition, which really does make a huge difference to how paintings look against them. Conversely, the best you can hope for is that this is so subtle that visitors won’t even notice it and will focus on the paintings instead. Edvard Munch: The Modern Eye is at Tate Modern 28 June – 14 October. Nicholas Cullinan, curator of international modern art, Tate Modern, is curator of the exhibition, with Shoair Mavlian, assistant curator. Join as a Tate Member and enjoy unlimited free entry to Tate exhibtions. I think this is a fantastic exhibition. I have always known about Munch but never actually seen a lot of his work. I think he has been seriously under exposed in England. Browsing through the various books afterwards (not good enough reproductions), I could have wished the exhibition had been even bigger and included many more prints. In my opinion he ranks with the best. Made my £90 membership well worth it! I came out exhilarated. Nearly every painting a winner.